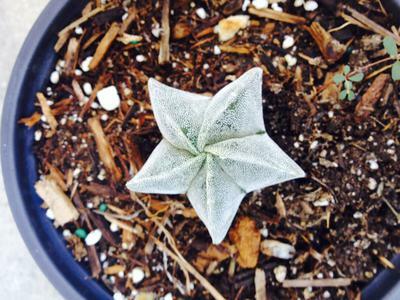 We recently bought a bunch of succulents but this little star shaped pod was a last minute buy and we forgot to ask what it was called! It was grown in Fillmore, CA. Sorry, Rachel, don't know this one. It's super cute though! The only plant that seems to be similar is Euphorbia obesum, which tends towards a much fatter shape that is similar. I wonder if this could be the same plant as a juvenile? This site has many examples, but none that show the star shape. Return to Succulent Plant Identification.